NCERT Textbook Solutions are considered extremely helpful when preparing for your CBSE Class 7 Science exams. TopperLearning study resources infuse profound knowledge, and our Textbook Solutions compiled by our subject experts are no different. Here you will find all the answers to the NCERT textbook questions of Chapter 14 - Electric Current and Its Effects. All our solutions for Chapter 14 - Electric Current and Its Effects are prepared considering the latest CBSE syllabus, and they are amended from time to time. Our free NCERT Textbook Solutions for CBSE Class 7 Science will strengthen your fundamentals in this chapter and can help you to score more marks in the examination. Refer to our Textbook Solutions any time, while doing your homework or while preparing for the exam. 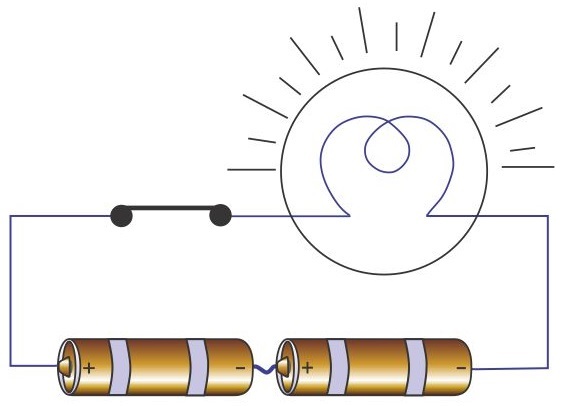 In the given circuit, one terminal of the bulb is connected to one terminal of the cell and the other terminals of the bulb and the cell are connected to a safety pin. However, the safety pin is not connected with one of the drawing pins. Thus, the circuit is not complete. Hence, safety pin represents a switch in 'OFF' position. The circuit diagram of the given figure is shown in the following figure. Concept insight: For current to flow it is necessary that circuit should be complete. As circuit is not complete here so bulb does not glow. To make a battery, the negative terminal of one cell must be connected to the positive terminal of the next cell, as shown in the following figure. The bulb in the circuit is not glowing because the two cells are not connected properly i.e., positive terminal of one cell is connected to the positive terminal of another cell. Thus, to make the bulb glow, the negative terminal of one cell should be connected to the positive terminal of the other cell, as shown in the given figure. Concept insight: Heating effect of electric current: When an electric current is passed through a wire, the wire becomes hot and produces heat. This is called heating effect of electric current. Magnetic effect of electric current: When electric current passes through a wire, it behaves like a magnet. This is called magnetic effect of electric current. The current flowing in the wire gives rise to a magnetic field around it which exerts a force on the compass needle (which itself is a tiny magnet) kept nearby and deflects it from its North-South position. Concept insight: A current-carrying wire behaves like a magnet. Concept insight: The given circuit does not have any battery or cell (current source). In the absence of current, the wire does not behave as a magnet and hence, the compass needle will not show any deflection. Concept insight: To make a battery, the negative terminal of one cell is connected to the positive terminal of the next cell and so on. Concept insight: An electric heater works on the principle of heating effect of electric current. Its heating filament has high resistance; so when electricity passes through it, it produces large amount of heat. Concept insight: Working of fuse is based on heating effect of electric current. So when large amount of current passes through a fuse, it melts and breaks the circuit. 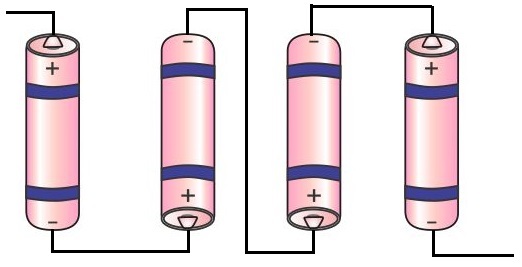 Concept insight: To make a battery of two cells, the negative terminal of one cell must be connected to the positive terminal of the other cell. Concept insight: The wire of the fuse is made of lead which has a low melting point. When large current passes through a fuse, it melts quickly and breaks the circuit. Concept insight: Working of an electromagnet is based on the magnetic effect of electric current. An electromagnet behaves as a magnet when current passes through it. Hence, it attracts a piece of iron. Concept insight: An electric bell has a piece of iron wound by a coil. When current passes through this coil, it behaves as an electromagnet. No, because plastic is a non magnetic substance so an electromagnet cannot attract and separate plastic bags from garbage heap. Concept insight: Important application based question. No, because fuse is made of lead wire which has a very low melting point. A fuse wire melts quickly and breaks when a large amount of current passes through the circuit. If the electrician replaces a fuse by a piece of ordinary wire (which has high melting point), it increases the risk of overheating due to flow of excessive current. This may lead to short-circuit and fire. (i) The rubber band used in the cell holder may not be tight enough to keep the two cells in contact with each other. If the cells are not in proper contact with each other, then the circuit will not be complete and current will not flow through the circuit. Hence, the bulb will not glow. (ii) The two cells may not be connected properly. The negative terminal of one cell must be connected to the positive terminal of the other cell. (iii) The bulb may be fused. (iv) The cells may be used up i.e. the chemical inside the cells has been exhausted. (v) The circuit connections may be loose. Concept insight: When the switch is in 'OFF' position, the current does not flow through the circuit. Hence, none of the bulbs will glow. Concept insight: When the switch is moved to the 'ON' position, then all the bulbs will glow at once. This is because all the electrons around the circuit move instantaneously at the same time. TopperLearning provides step-by-step solutions for each question in each chapter in the NCERT textbook. Access Chapter 14 - Electric Current and Its Effects here for free.